Steps to take to prevent a leaking roof. Did you know that tree limbs hanging over a roof is one of the biggest reasons for leaks in a home? The odds of having a roof leak by allowing tree limbs to grow over your roof or debris to build up on your roof is increased dramatically. 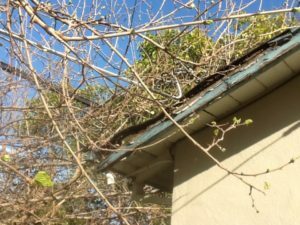 Over the years I have repaired damage to several roofs caused by tree limbs falling and poking holes in the shingles or simply wearing them out due to the limbs constantly rubbing across the shingles. Low hanging limbs are also typically used by squirrels as a highway to jump on your roof and transit to another tree. These little creatures will eventually try to find a way into your home and nest. Once you have squirrels in your home, it’s hard to get rid of them and they always seem to come back. I always recommend cutting limbs back 6-8 feet from the home. By doing so you will not have to worry about those pesky creatures ruining your shingles as most squirrels will not try to jump that far if they don’t have too. In addition to the tree limbs, allowing leaves and sticks to build up on a roof will also cause damage. 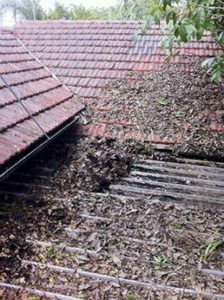 The buildup of these debris will not allow the water to flow off the roof quickly and increases the chance of water finding its way into your home. Buildup will also cause moisture to be trapped in those areas promoting fungal growth and slowly rot out your roof. Try to keep your roof cleaned off. If you cannot do it yourself, I recommend hiring someone to do it for you. This would be much cheaper than a new roof. While conducting roof inspections with overhanging trees and/or debris buildup I will spend more time in these areas to locate any damage. Any damage or concerns found are noted in the report with photo documentation of the damaged area(s). 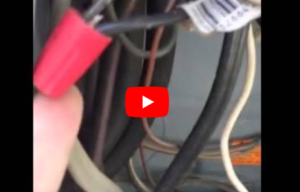 So, If you’re in the market to buy a home, look for these type things around the home and ask your inspector to focus in on areas of concern you may have.